Celebrate all things Star Wars(TM) decade-by-decade, year-by-year, month-by-month. From the influences and creation of the Star Wars movies, to the toys, books, comics, TV series and games and American pop culture, this beautiful Star Wars encyclopedia covers it all. 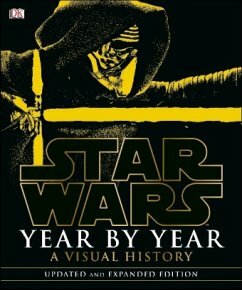 Painstakingly produced and superbly illustrated, Star Wars Year by Year: A Visual History presents a unique Star Wars timeline - the full history of the amazing Star Wars phenomenon as you've never seen it before, including the Saga's impact on popular culture and world events. This updated edition includes brand new content covering Star Wars The Force Awakens as well as the ongoing animated TV series Star Wars Rebels and new Star Wars-themed lands coming to Walt Disney World Florida and Disneyland California. With a foreword by the creator himself, George Lucas, delve into every aspect of the most famous galaxy far, far away. © & TM 2016 LUCASFILM LTD.